This full-sized wall mural features the original poster artwork for Star Wars: Episode IV - A New Hope. Have Star Wars: A New Hope on your wall! For the ultimate Star Wars fan! For anyone thinking of redecorating their house, the perfect time is now! 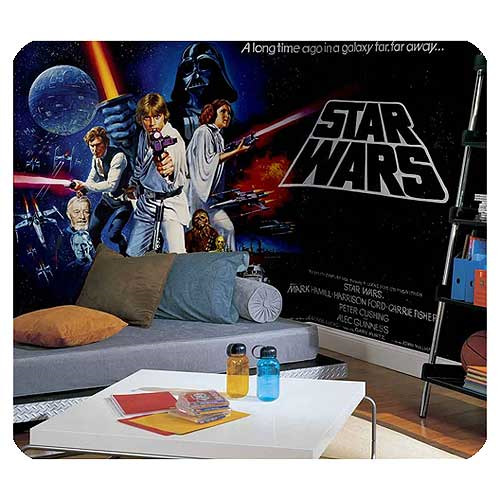 This gigantic wall mural of Star Wars: Episode IV - A New Hope measures approximately 9-feet tall x 15-feet wide. Easy to install and remove, it will transport your plain, old room to the nostalgia of 1977 all over again! Instead of using normal peel-and-stick technology, RoomMates XL Murals are printed on a revolutionary pre-pasted material called Surestrip that makes it much easier to install such large wall graphics. XL Murals are not peel-and-stick products. Rather, they're pre-pasted and water-activated. Just dip the strip into a bit of lukewarm water, wait a minute, apply to the wall, and smooth the strip with a soft brush. Then repeat the process with the next sequentially numbered strip. Your mural goes up in minutes, certainly faster than if you were to paint the same surface. RoomMates XL Murals remove easily, too. Simply pick two corners and start pulling off the wall. Each strip will remove in seconds and in full strips, with no tools needed!